Each year MADD Nebraska (Mothers Against Drunk Driving) honors those doing work to keep our state safe. The event recognizes outstanding work done by law enforcement, probation, prosecutors, community partners, and volunteers. Each one of the people recognized is a part of the puzzle, a piece that helps prevent impaired driving, educate our communities and ensure that laws are upheld. We know that each person is essential in creating a future with No More Victims. 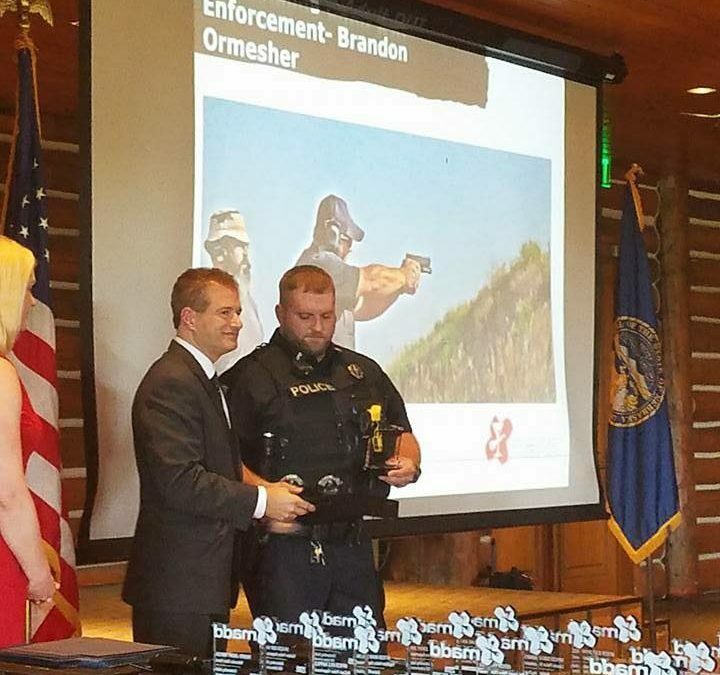 For the second year in a row, Valentine Police Officer Brandon Ormesher was awarded this prestigious honor. Officer Ormesher purposely seeks to make the Valentine Community a safer place to live, work and play. Officer Ormesher has demonstrated this with his high volume of impaired driver arrests. His passion for impaired driving enforcement and to become better at recognizing impaired driving has led him to participate in the Drug Recognition Expert course. Following the intensive training and testing, Officer Ormesher was rewarded for his efforts by receiving his certification as a Nebraska DRE. Officer Ormesher continues to work diligently in making Valentine better and better. Officer Ormesher graduated from the Nebraska Law Enforcement Training Center in spring 2015. He has attended Advanced Roadside Impairment training and is a certified Drug Recognition Expert. Officer Ormesher has been with the department nearly 4 years.